This is the perfect beach cottage lamp. This coastal lamp features a sand shell finish base decorated with sea shells in a circle resembling a sand dollar. Stands 35 inches high with a natural fabric shade. It is topped off with a shell for a finial. 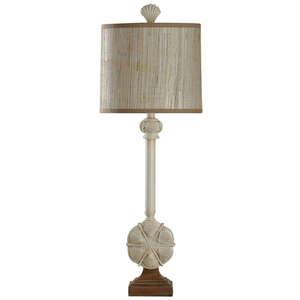 This Seaside Buffet Lamp will go nicely in any room.